Anchors and boats go hand in hand, right? Well, that’s what I always thought. As I grew up “in the water” using a leak-infested Sevylor inflatable kayak throughout the summer, I always had an anchor in the boat. I’d drop anchor, hop out of the boat and snorkel around the lake or just toss out a line and hope the fish wanted to eat. A Sea Eagle Anchor Kit. Includes top-quality anchor line. View all Sea Eagle Anchor Kits. So when I purchased a real inflatable kayak, a Sea Eagle Explorer 380x, I naturally bought an anchor to go with it. And I re-discovered several things. The most obvious being that an anchor is heavy. Now, for paddling on a small lake while fishing, the weight of the anchor is no big deal. But for a long-distance float trip, where every ounce matters, the idea of hauling a 10-pound anchor with 25 feet of rope suddenly started to look like a rather stupid decision. Then there’s the bulk. In an inflatable kayak, an anchor is typically stored at the very rear or front of the boat, tucked away beneath the splash guard. For a day float, there’s plenty of room to stash the anchor. But on long, overnight float trips where space is at a premium, having an anchor stashed away in a spot where I wanted to put two gallons of water (using a MSR Dromedary Bag, which is perfect for inflatable kayaks, by the way), seemed like a waste of space. I mean, what would you rather have – an anchor or water? Finally, there’s the “ouch” factor. This isn’t a concern in my inflatable kayak, but has played a rather prominent role when I use my small Sea Eagle inflatable raft. Unlike the kayak, the raft doesn’t have a good stash place for the anchor. Thus, you have to share space with a solid piece of steel inside the boat. It’s inevitable that sooner or later your foot will bash the anchor, or you’ll hit a wave wrong and the anchor will tumble down the boat and land on your feet, your leg, or, umm…your private spots. So let’s get back to the original question. Do you need an anchor for your inflatable boat, whether it’s an inflatable raft, kayak or something else entirely? And it all depends on where you’ll be using your boat and what you’ll be doing with it. So let’s go over some activities where an anchor is needed, and where it isn’t. Lake Fishing – Duh. Common sense stuff here. For lake fishing, definitely bring an anchor along if you’re just out for the day. You have the space in your boat. And who wants the wind to blow you away from a prime fishing spot? So for a one-day lake fishing trip, the answer is a definite yes. The question is more nuanced if you plan to overnight. Most boats have the weight capacity and space to stuff an anchor somewhere in the boat for overnight lake paddling trips. However, if part of your paddling plan involves portages, you might want to reconsider an anchor. If you’re in the Boundary Waters, do you really want to carry an anchor between lakes? Flatwater Paddling – If you’re out paddling across flatwater, there’s plenty of reasons to bring an anchor – even if you’re not chasing fish. Sometimes it’s just nice to stop and rest and not have the wind blow you all around. And for day trips there’s plenty of space inside the boat. So why not bring an anchor along? River Fishing – For river fishing, the only people who need anchors are guides who use drift boats. And even then, I rarely see them actually use the thing. Bringing an anchor along on a river float trip is a recipe for problems. And even if no problems happen, it’s still annoying to have an anchor weighing down your boat. In short, for river fishing from an inflatable kayak, inflatable raft or pontoon boat, leave the anchor at home. About the only possible reason to bring an anchor along on a river float trip is if you know that the current is very slow, or non-existent. And there are no rapids that can send your anchor tumbling around the boat. In short, you can bring an anchor along if the water is flat and there’s little current. For trips on rivers like these, an anchor can prove helpful – especially if you’re fishing. Playing In the Ocean – You’re kidding, right? Ocean waves are rather large. And move rather fast. And even in many sheltered bays, waves become quite large if the wind picks up. The last thing you want in big waves is a steel anchor tumbling around inside your boat or kayak. What Kind of Anchor To Get? If after reading this article you decide that your boat uses require an anchor, then the next step is to determine what type of anchor to get. Just as importantly, you need to make sure to get the right rope to keep the anchor attached to the boat. So let’s go over some options. For starters, you can always get what I got – an anchor direct from Sea Eagle. Their anchors are designed for inflatable boats and work well. They aren’t obnoxiously heavy. And the mushroom anchor design works well in preventing the anchor from getting snagged on underwater obstructions. Best of all, their anchor comes with quality anchor rope. Their anchor rope is marine quality, which is another way to saying it won’t rot or turn to a mildew mess in a few years. Another big benefit of marine rope is that the rope is soft. You can pick up the rope and let it out without worries of the rope puncturing your hand, or your boat. In other words, there’s nothing sharp on it (compared to many nylon ropes, which can develop sharp strands as the rope frays over time). Long and short of it, if you want an anchor for an inflatable boat, the Sea Eagle anchor kit is a good place to start. But there are other places to buy anchors. Cabela’s carries a large assortment of anchors, as does Bass Pro Shops. I’ve even seen them, on occasion, at Wal-Mart. And of course, you can find anchors at Amazon. However, if you buy an anchor, remember you need rope to attach it to your boat. Do NOT make the mistake of buying nylon rope. It frays easily and is really harsh on your hands. Spend the extra money and get good quality anchor line (or marine) rope. Marine rope won’t fray easily, is soft on the hands, and most importantly won’t rot away because it’s wet. Marine rope can be tough to track down. On occasion I’ve seen some at Home Depot, but never at Lowe’s. Since finding marine quality rope is hit or miss in brick and mortar stores, I’ve bought all my marine rope through NRS. Their rope is top quality and looks as good as new despite being permanently attached to my inflatable kayak since 2011. 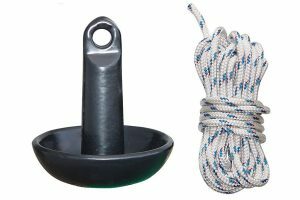 Amazon also sells anchor line and marine rope, too. There are alternatives to carting around a steel anchor in your boat. One solution is called a Squid Anchor, made by Sea Eagle. Basically, it’s a “bag” that can hold rock, sand and other debris. When you know you’ll need to anchor out, just fill up the flexible bag, attach the rope, and you have an instant anchor. Once your done needing an anchor, you can then empty out the bag and pack the anchor away somewhere. It only weighs 7 ounces empty and packs nice and flat. Overall, this anchor is a neat product that avoids the problem of carting around a infrequently used heavy steel object at all times.